Vermont was the undisputed snowfall champ this season. Jay Peak Resort led the way with 357 total inches as of April 13, 2015, far outpacing western resorts in accumulated snow, and at 100% open, the resort doesn’t plan to close until May. Vermont is the undisputed snowfall champ this season. Jay Peak Resort leads the way with 357 total inches as of April 13, 2015, far outpacing western resorts in accumulated snow, and at 100% open, the resort doesn’t plan to close until May. Other resorts in Vermont have similar stories of record snowfall. Killington Resort, supplementing their nearly 200 inches of natural snow with efficient snowmaking, has snowpack of up to 30 feet - enough to plan to keep the mountain open for skiing and riding until June. Ski Vermont resorts have seen an average of about 240 inches of snow this season and with winter’s grip holding fast through March, much of that snow is still on the ground softening up under spring sun. The US National Weather Service snow stake at the top of the highest mountain in Vermont, Mount Mansfield, home of Stowe Mountain Resort, read 7 ½ feet as of April 9, 2015, a record amount for the season and far above the seasonal average. “During the month of February alone, 76 inches of snow fell - an all-time record for that month,” said Dave Meeker of Mount Snow Resort. “In fact, all of that snow fell within a 21 day period from February 2nd through 22nd.” Mount Snow has received 193” of natural snow this season, which is the most since the 2000/2001 season. Nearby Stratton Mountain Resort also saw over 70” of snow during the snowy month of February, far outpacing previous years’ accumulations. As of mid-April, many of Vermont’s smaller ski and snowboard areas have closed for the season, but closing days saw many at 100% open and with plenty of snow on the ground. 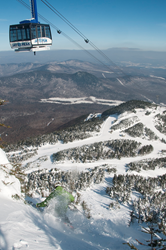 For a full list of open Vermont ski areas and snow conditions, visit skivermont.com.